Check out this video of our DIY held in August! Recently we ran the DIY: Stylus program. This project is insanely easy and you'll end up with a Smartphone stylus that works just as well as anything you could buy online! Below is a video tutorial on how to build your own. Also included are some suggested apps to try out your stylus with. Draw Something - Everyone's heard of this one. This game is similar to Pictionary. There are both a free and paid version of this app. If you've never played it, what are you waiting for? Try it out! Spray Can - Awesome app that lets you tag the sides of trains, brick walls, and all other Graffiti "canvases". This app is completely free and also allows you to post your artwork to an online community for critiques. Brushes - For those of you that enjoy painting but hate all the mixing and mess involved, you're in luck! With this app you can create amazing paintings by using a variety of different types of brushes and even creating your own. SketchBook MobileX - This app, created by Autodesk, is a fantastic program to . . . well, sketch. Regardless, this is a pretty great app for doodling and it gives you a lot of options. Similar to Brushes, you can create your own brush patterns anyway you like. DoInk - DoInk is a ton of fun. Here's the catch, it costs $5, but it is worth every penny. Since downloading this I have played with this app at great length. DoInk allows you to draw frame by frame animations, and then you can drag and drop your animations into scenes. Best of all there's virtually NO learning curve. I would recommend this program for anyone that loves drawing and animation and would like to experiment with it! Well last month was a blast for DIY, we created raw ice cream and edible chocolate bowls! If you were unable to attend the program, don't worry! Attached to this post are the instructions for you to create your own ice cream sundaes! Simply click the title of this post and the file will be at the bottom. For May we had a DIY project that was a bit of a throwback, string art. String art has been around since the early 19th century but didn't really become popularized until the 1960's. Using cork board, some map pins, and embroidery floss you can create really interesting mathematical and other geometric designs. You can see a gallery below of what our attendees created. Would you like to create your own string art? Take a look at the video below to find out how! Any avid gamers out there? Well you may like to play video games and you may even boast a high score or two, but have you ever thought about how video games are made? Better yet, have you ever considered making one of your own? At Saturday's DIY program, a group of teens had a chance to make their own video games using a software called Construct 2. We met up in the library's Training Center and created a simple game using the software together. Afterwards, the teens had time to make whatever modifications and additions they wanted — effectively creating some seriously bizarre and fun games that other attendees got to try out. Want a shot at making your own video game? Download the software we used onto your Windows PC and take a look at this tutorial that'll go through the steps to get you started! Below is a short clip of a teen playing the game he created. And yes, that's a unicorn shooting a laser out of its horn. If you're really interested in making video games in the future (maybe even as a CAREER! ), you might be interested in checking out this book from our collection! Check out some of the DIY Duct Tape Wallets made at our last project! Franken-Zombie Toys in the Hub! Last Friday we gathered in the Hub to construct freaky, mutant toys. Using old toys, needle & thread, LEDs, duct tape, and anything else we could find, we took apart and fashioned toys Dr. Frankenstein would be proud of! A few of the teens brought their critters to life as marionettes. Browse the pictures to see some of the creepy creations the teens came up with! How to make a ZomCom! Did you hear that? Be alarmed. That's the sound of zombies eating flesh in the Hub! Well, not really but we've already had a bunch of teens come in and make hilarious and creepy stopmotion movies with little zombies as the undead stars of the film! You can do it too. Just bring a partner and get moviemaking. If you want to try this at home, we won't be responsible for any lives claimed by Zombies. A whole bunch of mini figurines (These will be your 'actors'. We got our Zombies at the one of a kind extremely odd store American Science and Surplus, which isn't too far away.) Or just raid your old toy chest. Little ornaments, dollhouse furniture or other toys. This is how you build your set for the movie. A tri-pod! This is important as one key element to stop motion is that you want your characters to move just a little bit between the taking of photos. A tri-pod will keep your viewer oriented to the action. TIP: You need to be judicious when you move the camera! Background for your set. We used a cheap tri-fold posterboard. Feel free to add art and create a vivid scene! A partner. You need a partner for stop motion. One person to take pics, the other to move the figurines just a little bit closer ... to the rotting flesh! Last Saturday, May the 4th (be with you), was National Star Wars Day. In celebration, the HUB had a program where we learned about basic circuitry and made jawa figurines with light-up eyes. I promised to post instructions for those that weren't able to finish during the allotted time - threading conductive thread into the eye of a needle is difficult! If you didn't attend and want to make your own jawa with light-up eyes, I modified this build to accommodate budget and length of the program. Please feel free to stop by the HUB if you have any questions or need help with your jawa! Using conductive thread, sew the positive wire. Make sure you are sewing the LEDs on the inside of the figurine. In the diagram below, it's shown as "+" signs. Once your wire is below the battery access slit, attach the battery holder by sewing through the copper positive terminal. Next, sew the short negative wire, shown as "-" signs and highlighted in the diagram. Begin at the copper negative terminal on the battery holder. The end of the wire should be on the front side of the figurine (opposite the battery holder). Now, sew one part of the metal snap using the conductive thread. This will serve as the switch for the jawa's eyes. You will now sew the other negative wire, also shown as "-" signs and highlighted. Begin by sewing the other part of the metal snap switch to the flap on the front of the figurine. Insert the battery into the holder and test the LEDs to make sure that your circuit is complete and not shorting out. If the eyes light up, sew most of the jawa body closed around the outer edges of the figurine. Leave a small opening so that you can stuff the figurine with polyfill. Stuff the jawa and sew the small opening closed. 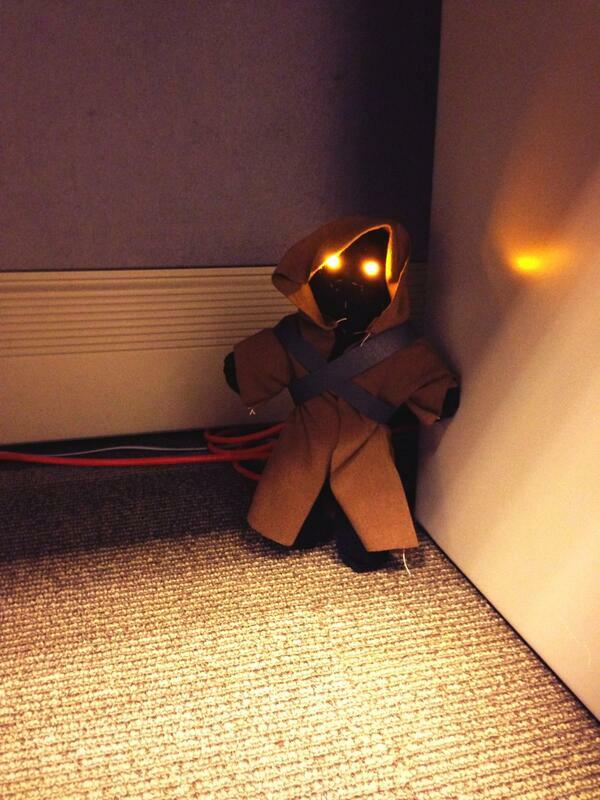 Put the robe on your jawa. Tape the black construction paper around it's body to hold the robe closed and serve as his equipment belt. February is " the library" month and we're celebrating in the Hub! Come out and up-cycle an old book or make a book-based paper craft. There are many different project ideas in books we've checked out for the Hub (like The Repurposed Library and Art Made From Books) or come up with your own project! We even have a photo booth for you to pose with your favorite item from the library's collection or something you made in the Hub. Take one copy of the picture home with you and leave the other here telling everyone why YOU the library!